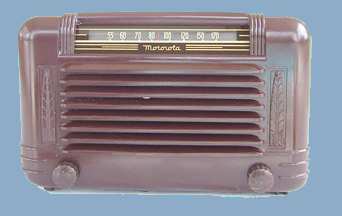 This is a 6 tube superheterodyne Bakelite table radio that tunes just the broadcast band. It is built without a power transformer but due to tube advances, no resistance line cord or ballast tubes are required. Commercial radio production was stopped during WWII as the radio manufacturers built military equipment. 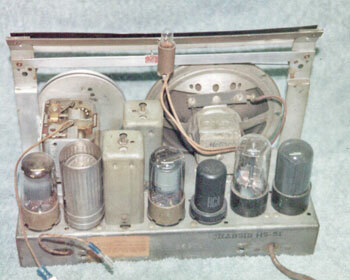 This is one of the first post WWII commercial radios. _Motorola was the brand name used by Galvin Manufacturing which was founded by Paul Galvin in 1928. Galvin started out making battery eliminators then branched out into auto and home radios, becoming one of the largest producers in the USA. Galvin officially changed its' name to "Motorola" in 1947.